Each gathering is held at a Greater Newtown establishment. 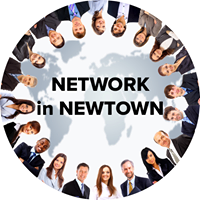 Network in Newtown is a fun, comfortable gathering to make business connections and friends in Greater Newtown. We are a group of professionals who believe that god business relationships need to be nurtured in a relaxed friendly atmosphere. We meet twice a month in a Happy Hour setting. We gather in Chamber member restaurants and bars. Enjoy a cash bar with happy hour pricing. To receive text notifications of all upcoming events text “networkinnewtown” to 71441. Network in Newtown is powered by eFriend Marketing and supported by the Chamber of Commerce of Newtown.